The lock of LOVE…how leaving a love padlock with a custom engraved message has become a modern-day romantic ritual. This practice has rapidly gained momentum emerging around the world. People are always looking for unique and different ways to share their love. The custom of a love padlock being locked to a fence, gate, pole and many of the famous bridges has bought peace and unity. The more LOVE we can share in today’s world the better I say! Since 1972, the United Nations Educational, Scientific and Cultural Organization (UNESCO) has defined sites of world cultural heritage as being “of outstanding universal value from the historical, aesthetic, ethnological or anthropological point of view”. 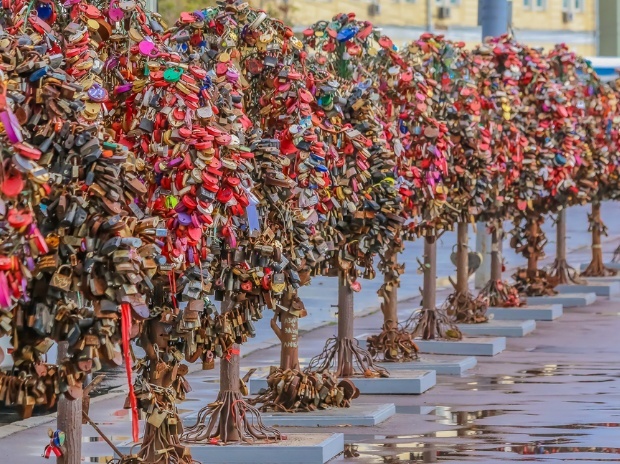 Surely, these masses of love locks – which represent what is probably the most widespread ritual deposit of the 21st century – constitute sites of outstanding universal value. So, why aren’t ethnographers, anthropologists, and cultural heritage specialists clamoring to preserve this custom, either in practice or in print? Heritage specialists should be engaging with love lock sites on a case-by-case basis; contemporary archaeologists should be cataloguing these ritual deposits before they’re disposed of. Rather than waiting for love locks to develop the heritage “value” that comes with age – so that future generations will have nothing to ponder over but remnants – we should be engaging with this custom now, while it’s still thriving. I love to see articles that embrace this ancient custom of couples, families and friends sharing their love and commitment by “locking their love” with the universal LOVE LOCK.